The Mission of the Potawatomi Area Council, Boy Scouts of America, in cooperation with chartered partner organizations is to help an ever-increasing number of youth mature into adults exhibiting traits of participating citizenship, character and personal fitness founded upon the moral and ethical values expressed in the Scout Oath/Promise and Law. The Scout Oath and Law are primary in everything we do. The Boy Scouts of America program is an ongoing adventure that teaches a powerful set of real-life skills and develops fundamental qualities that help its 57,000 youth members, in Wisconsin, become Prepared. For Life®. In Wisconsin, 19,094 adults serve as Scouting leaders. 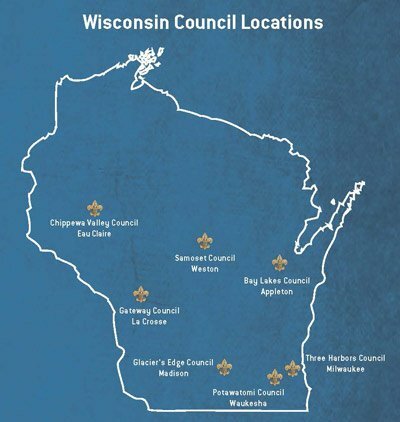 Wisconsin Scouts officially recorder 55,527 hours of service to their comunities, at a value of more than $5.5 million. Our Scouts collected more than 1 million pounds of food through the Scouting For Food Program.